This weekend I found a very interesting green in my CSA box from Gaia’s Breath Farm, called hon tsai tai. 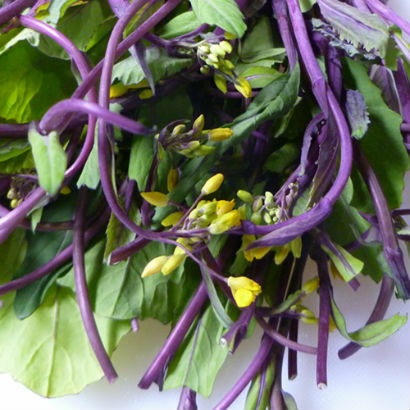 Hon tsai tai is an Asian leafy plant that has dark green leaves with purple veins. Interesting to this plant are the stems, which are a rich deep purple color with tiny yellow flowers. Hon tsai tai has a flavor very similar to broccoli raab, but not as strong: it’s sweeter in flavor with a more delicate textured leaf. It can be easily eaten raw, though I prefer it slightly sautéed, which helps take the edge off. 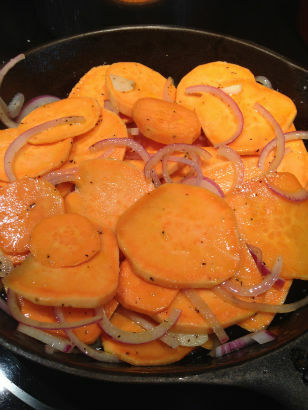 With an extra sweet potato hanging out on my counter this week I decided to see what I could do to combine the two. I had a request for a “fancy omelet” at home over the weekend, and thought: why not try a Tortilla Española? 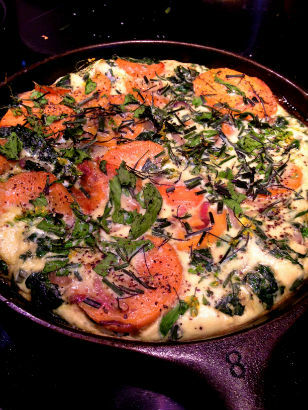 Starting from a classic recipe, done by Mario Batali for Food and Wine, I gave it my farmer’s market twist. After a quick saute of the onion and sweet potatoes, I placed them in a bowl and then wilted the chopped leaves of the hon tsai tai, but keeping the stem and flowers separate. 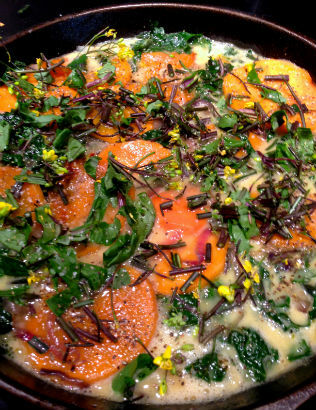 Then I layered the greens between the potatoes, added the eggs and topped with the chopped stems and flowers. It was quite striking right out of the broiler, and admittedly, quite delicious. A perfect meal in under 30 minutes. 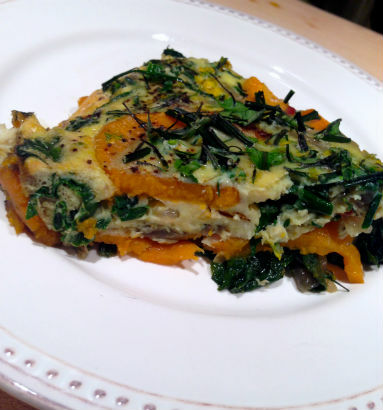 Click this link to see my recipe for Farmers Market Tortilla Española. In my travels around the Westchester farmers markets I have only seen this pretty green on the Gaia’s Breath Farm table. Look for them at the Irvington Farmers Market, Bronxville Farmers Market, Larchmont Down to Earth Farmers Market and the Gossett Farmers Market..